Wine Club Manager, Annette Dennigmann, has been with Adelaida since November of 2008. From then on, working at Adelaida has become more than just a job. It was through her time at Adelaida that she met her husband and eventually they were even wed by a coworker! Annette has watched Adelaida's growth over the last seven years and is extremely grateful to have been a part of it. When asked what she loves most about her job she will always say, "The Club Members!”, reflecting on the great people she has met here at Adelaida and looking forward to meeting many more. When she is not busy shipping Adelaida wine all across the country, she enjoys time with her friends, family, and most of all, getting love from her grand babies. Annette always strives to do her best when accommodating our Club Members and she has an amazing assistant who shares the same passion for customer service. Morgan Kavanaugh joined the Adelaida team in the Fall of 2013. As our Sales Coordinator she works closely with Annette and all things wine club. Whether managing orders or chatting with Club Members, Morgan is always ready with a smile. Having received her B.A. 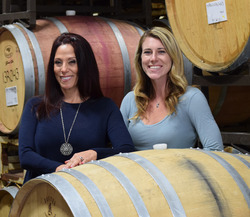 in Environmental Studies from UC Santa Barbara, Morgan has also taken an interest in our sustainability program and played an important roll in filing for our recent certification through the California Sustainable Winegrowing Alliance. When not at work, Morgan loves exploring the outdoors and enjoying the wonderful wines of the Central Coast. In a rare, quiet moment during the 2014 harvest season, Annette Dennigmann, our Wine Club Manager, sat down with Winemaker Jeremy Weintraub. Jeremy holds a Master of Viticulture and Enology from UC Davis and has worked on the North and South Islands of New Zealand, in Italy, and in St. Helena California. Now settled on the Central Coast, he has been with Adelaida Cellars since 2012. Q: What was the first fruit that arrived for the 2014 vintage? A: We picked a small portion of chardonnay for its bright and energetic potential. Last year we split our 3.8 acre chardonnay block into three separate parcels that differ in slope, aspect, and elevation, enabling us to pick across a range of flavors. Q: 2014 marks the 50th anniversary for the HMR Pinot Noir vines. How does the age of the vines contribute to the wine? A: The fruit from older vines produce wines of greater depth and complexity than do their more youthful counterparts. The differences are not quantifiable. You simple know it when you taste it. Q: We have a new baby on board, the concrete tank. How does this differ from stainless or barrel? What will this bring to the wine? A: We're planning to use this tank for fermenting and aging grenache noir. Concrete tanks highlight the purity of the fruit inside and also, compared with, say stainless steel, allow for rich flavor development. Unlike oak, concrete imparts no toast character or tannin. Q: What impact of challenges has the California drought had on this harvest? A: Incredibly, we haven't seen any negative effects of the drought. Our farming plan now and into the future is to severely ration the amount of water we deliver to our vines, with the dual goal of making more interesting wine and conserving this precious resource. While drought is a major concern for us, our vines so far have weathered it well. Q: When did you begin your career as a winemaker? What do you like best about your job? A: I started on Long Island, driving a tractor for a family owned vineyard and then working harvest in the winery. What I loved then is what I love now: tasting fruit in the vineyard, smelling fermenting tanks, getting incredibly sticky, and sharing those long days with like-minded people. Q: What changes have you made in the vineyards since you started? A: Beginning 2013 we stopped spraying herbicides and we moved to organic fungicides, such as mineral oil, from synthetic sprays. Being good stewards of the land has always been a priority for Adelaida Cellars. It's essential for the long term success and health of your farming operations. Q: We have three interns that we added to our already amazing production team for this year's harvest. Could you tell us a little something about them? A: We have an intern from the University of Bordeaux, France, an intern from the University of Udine, Italy and a recent graduate from the University of California, Davis. The interns are hardworking and serious. Plus they are making us some delicious meals!